The dispute about the birthplace of wine seems to be a never ending story. Was it Georgia, Turkey, China, or even the Valais? However, not every single grape seed or some tartar in a stone vessel is already a hint, let alone evidence that the pot was used for wine-making. Grapes can actually be turned into quite different healthy foodstuffs. It is a trip across cultures. In the field of archaeology, scientific issues as well as excavation goals have changed over the past decades. Multidisciplinary research has become self-evident. Chemists can now tell food and drink consumed thousands of years ago, just by examining residues in ancient ceramic and other containers. Geneticists are able to make clear statements about the relationship between different food plants and their places of origin. The situation becomes particularly exciting whenever the topic is wine, because wine growers, wine lovers and nationalists too, share the thrill of finding out where exactly the birthplace of wine was. Every single new excavation between southern Europe and China offers great hope for more detailed first-hand knowledge. When grape residues are found in archaeological excavations, they are mostly interpreted as indicators of wine. Western scientists almost exclusively speak about wine in their publications. The main reason for this is probably their language and culture. They call the grape garden vineyard, i.e. wine garden. Grapes are always wine-grapes. In their opinion, the existence of tartar or tartaric acid implies that there is wine although these elements are not only present in grapes or wine. An explanation for these misinterpretations is the fact that neither Western Europe nor America has had a “history” of grapes or wine. Grapes have at no time been cultivated or wine developed. Wine has always been provided as a ready-made product, along with the relevant technical terms. Wine-scientists are undoubtedly rarely aware that in the beginning totally different grape products and products from other fruits prevailed. In the Middle East, however, the grape is neither linguistically nor culturally focused on the utilization as a wine-grape for vinification. In the Middle Eastern countries, grapes are still processed and consumed traditionally in many different ways. Hattusha, the ancient Hettite capital at about 1400 BC Store rooms next to the temple in the lower town. The two küps (amphorae) on the right have a broad flat lip. They were used for wine. The other two küps were meant for other liquids. The scientific chase of the origin of wine started in 1991 during the international symposium about “The Origins and Ancient History of Wine”, held in Robert Mondavi’s wine cellar in California. The meeting was based on chemical analyses of residues in pots from the Godin Tepe (Iran) excavation which dates back to 3500 – 2900 BC. Apart from tartaric acid, terebinth had been found in the residues (1). According to Patrick McGovern of the University of Archaeology and Anthropology in Philadelphia, the resin of this tree from the pistachio family is supposed to prevent wine from being spoilt, or rather, from transforming to vinegar. McGovern’s presumption is based on a rather randomly quoted statement by Pliny the Elder. McGovern called that wine resin-wine. McGovern believes to have found some even older indication of wine in Georgia. He succeeded in proving the existence of tartaric acid in a clay vessel dating back to 5800-5400 BC, which was discovered in an excavation of the Shulaveri-Shomutepe culture (3). Georgia claims to be the country of origin for viticulture as well as for viniculture. So McGovern’s statement was falling on utterly fertile ground. Georgian scientists studied eight grape seeds found in two excavations. As the seeds are quite big they were taken as evidence of grape cultivation in the Neolithic period (4). The statement was furthermore supported by analyses of pollen that had also been found in clay pots at another excavation site. According to Georgian scientists, the pollen revealed the existence of a typical plant community similar to those in today’s East Georgian vineyards (5, 6). Besides, the early ceramics of the Shulaveri-Shomutepe culture were frequently decorated with so-called “knubben” (lugs).On one of the excavated pots these knubben are arranged like a cluster of grapes. The Georgian scientists consider this pot the very first clay jar for wine (kvevri) and interpret the vessel as evidence that there was wine in Georgia as early as in Neolithic times. The enormous variety of vines in Georgia is also believed to prove that the country is the original home of wine. The Russian botanist and plant geneticist N.I.Vavilov described the Transcaucaus as a region of genetic diversity in grape varieties and therefore as possible origin of wine (7). However, Vavilov’s specified data about the genetic diversity of grape varieties were collected in the former Soviet Union. Today’s data actually show different results. There are 1200 varieties in Turkey and about 400 in Armenia (8), compared with just over 400 in Georgia. 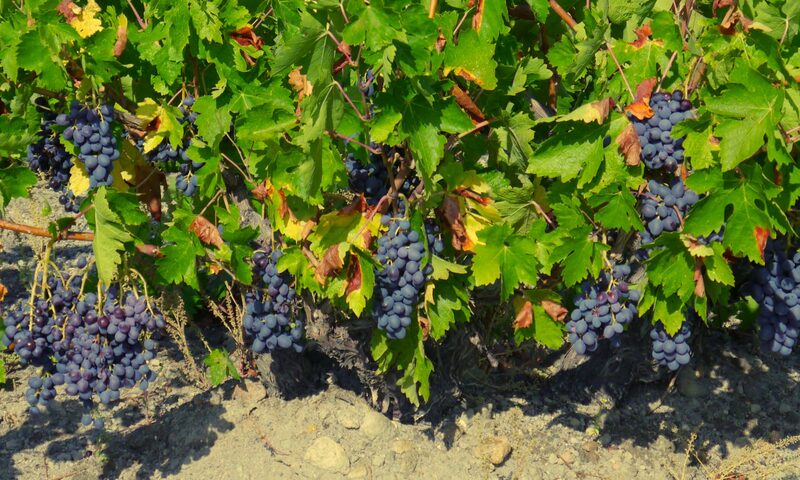 According to the garden and viticulture institute in Tekirdag more than another 800 Turkish varieties have not yet been taxonomically described (9). Wine depot on the Mediterranean. The küps are inserted into the gravel of a river estuary. As the river was constantly running underground, the wine in the küps was being kept cool. In a 2009 publication the American archaeologist went even further when he claimed that his research, a combination of archaeological and chemical investigations, would adequately demonstrate that the earliest wine culture in the world had been formed at least as early as about 7000 BC in the mountain regions of the eastern Taurus, the southern Caucasus and the northern Zagros, and that this culture had then begun to develop a dominating role in economy, religion and society (12). McGovern eventually identified tartaric acid in two stone bowls from Southeast Anatolia. He concluded that these much older vessels originally must have contained wine, not beer (12). The stone pots originate from pre-ceramic Körtig Tepe in Southeast Turkey. They are dated ca. 9600 BC (13). However, McGovern’s interpretations (not his research methods) were criticized by numerous expert colleagues. H.Barnard (14) argues that neither tartaric acid nor terebinth resin prove the existence of wine. G.Forni (15) criticizes McGovern’s statement that grapes were domesticated in the Near East quite early but does not mention the early domestication in other Mediterranean and Central Asian regions. In the following section, I am going to summarize the arguments against the cultivation of the grape in just one region and also against the theory that wine culture started in the Neolithic Age. Genetic diversity in grapes is commonly known today for the whole Near East, not just for a small region. There is no indication either that the natural occurrence of wild vines would be evidence of grape cultivation at only one place. Actually, finds and genetic tests indicate that wild grapes may have been cultivated independently in different regions (e.g. in Greece and Spain) and that they were at some time also used to make wine. The finding of terebinth, in connection with residues of tartaric acid does not prove the presence of wine, even if Pliny the Elder’s Natural History, book 14, is incorrectly but frequently referred to. Pliny only mentions in chapter 24 (120) that some inhabitants of Italy add black pitch to wine to make it taste less rough. He also writes that those Italians and several inhabitants of neighboring provinces enhance must with resin. In chapter 25 (127) Pliny quotes Cato who had declared resin the least applied preserving agent. It is certainly an over-interpretation that Pliny would have recommended the use of terebinth resin to delay or even stop the process of vinegar formation. In book 14, Pliny describes in detail the multipurpose use of terebinth as a spicing agent, but he never writes that it could be used to stop wine turning into vinegar or that it makes wine last longer. In particular along the eastern Mediterranean coast, terebinth is used as an intense condiment in many ways, even today. The fresh leaves of the terebinth tree are also used to flavor cooked pulses and other cooked vegetables. Terebinth blossoms are baked into the village bread. Terebinth fruits are dried and ground for making some kind of “coffee” (citlik kahve’si in Turkish). Terebinth resin is commonly used as concentrated seasoning. Moreover, the Greeks do not drink their retsina because the resin makes the wine last longer but because they like the resin-taste. It is not possible to provide evidence of the existence of cultivated grapes by describing the size and shape of just a few grape seeds, above all, when they come from different excavations, as was the case in Georgia. The natural variety of grape seed shapes is far too great for such claims (17). The find of grape pollen in a Neolithic (honey) pot was compared with an assortment of pollen from contemporary vineyards in East Georgia and classified as almost identical. However, this find does not allow any definite statement about cultivated grapes in the Neolithic period. In the Neolithic, grapes would definitely have only grown on trees but there did certainly not exist a grape monoculture with clipped vines like in Georgia’s prevailing viniculture today. The traditional “vineyards” of Karkin/Cappadocia are fruit gardens. Different fruit trees alternate with four to six grape varieties used for making pekmez or wine, unless they are sold as fresh fruit. A stone summer house and some basalt troughs are part of every fruit garden. Is it Beer or is it Wine? There is yet another product speaking against the existence of wine in Neolithic times. It is the cult beverage beer. Göbekle Tepe is a temple complex in Southeast Turkey (Urfa). The oldest findings are estimated at approximately 10,000 BC. The temple complex consists of massive tall T-shaped pillars arranged in circles around two central pillars. The pillars are decorated with animal and anthropomorphic representations. More sites have been discovered in the near surroundings but most of them have not yet been excavated. The sites were constructed by non-sedentary hunters and gatherers. After only a short period of utilization the temple site was obviously filled with debris and an enormous amount of animal bones, thus forming the hill Göbekle Tepe. The bones are interpreted as leftovers of voluptuous festivities. 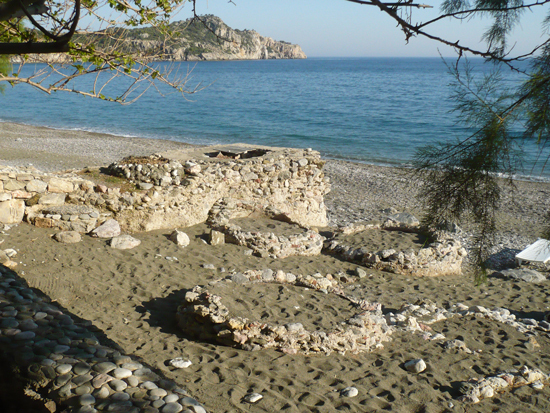 Similar feasts held by non-settled hunters and gatherers are known from other excavations. These regular celebrations were most likely a major challenge to the local production of food, fostering the development of new food items and food-processing methods. The character of Göbekle Tepe clearly reveals a significantly cultic element of such feasts. The very first types of wild cereal (einkorn, wheat, barley) were grown in the vicinity of Göbekle Tepe where undoubtedly beer was brewed. Low residual amounts of calcium oxalate crystals were found in big stone troughs. Calcium oxalate is left when cereal ferments after grinding and therefore traces of calcium oxalate indicate malt and the production of beer (18). McGovern argues that the process of making beer would be rather complicated because yeast has to be added on top of cultivating and processing the basic product. In his opinion it is much easier and therefore preferable to make wine (19). So, he claims in one of his later publications, “The world’s first wine culture – one in which viniculture, comprising both viticulture and wine making, came to dominate the economy, religion, and society as a whole – emerged in this upland area (the eastern Taurus, Caucasus and northern Zagros mountains) by at least 7,000 BC” (20). In my view, however, this is only true for beer but not for wine. Beer made from wild barley does not need additional yeast (21). The barley just has to germinate. At Göbekle Tepe there are lots of small basin-like depressions in smooth polished stone surfaces and also, particularly apparent, on some surfaces of the T-shaped pillars. When a few barley grains together with some water are placed in these depressions, the grains quickly start to ferment. If the green sprouts are then crushed and put into a larger stone vessel, together with more water, fermentation begins in no time. The process may be speeded up by adding honey. In this way beer can be made at any time and in whatever quantities, all over the year, whereas wine may only be produced once a year. Besides, the fermented drink wine has to be kept in airtight containers for many months. Consequently the cult beverage at Göbekle must have been beer made from wild barley, not wine from wild grapes. Anyway, if beer could be produced as a cult beverage at any given time during the early Neolithic, there was certainly no need for a second cultic drink that could only be made once a year and consumed or kept over a rather short time. Several arguments give rise to the assumption that during Neolithic times it was not wine that was produced as a grape product but various other produce. The production of nourishing foodstuffs was one of the major goals in Neolithic subsistence economy. Securing the durability of foods over a longer period would also have been extremely important. Wild figs, wild grapes and plums, wild pistachio nuts, almonds and hackberry (celtis) fruit were consumed fresh or dried, maybe also as components of drinks, long before Neolithic times. The cult drink in the Neolithic was beer, which could be produced at any time and always drunk fresh. Besides, sealable containers were not needed for beer. 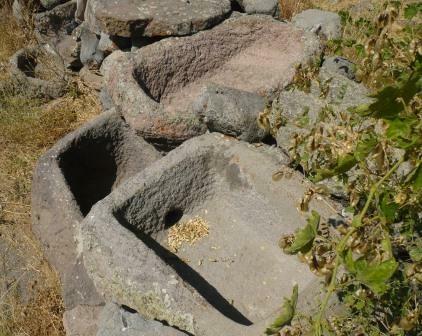 Basalt troughs in the fruit gardens of Karkin. Grapes and other fruit were trodden in the troughs. The juice, often together with the pulp, was heated and thickened in situ or taken to the summer house to ferment in küps. Some of these troughs are still used today. Although it was not possible to store grape juice in the early rough jars of the ceramic Neolithic, juice could be thickened by heating, to form syrup that would keep. A mixture of cereal flour and fruit syrup would have been very nourishing and also a luxury food item. Sun-dried thin layers of fruit pulp would have been available as power food throughout the year. Nowadays these products and other fruit juice produce are still part of the traditional dishes in the Near East. For reasons stated above, it can be concluded that wine does not fit with the subsistence economy of the early Neolithic period. Furthermore, most jars from the early ceramic Neolithic were still quite rough and could therefore not hold water or wine over any longer time. The pots would leak and could not be sealed. The first slightly larger vessels resembled in shape the holes in the ground that had earlier on been used for storing food. The rims of these early jars were thin, and they did not have a narrow opening or broad lip, which is essential for tight sealing with a lid or clay plug. Fired clay pots became leak-proof only later on when mineral tempering had been developed. But even then wine could not be kept over a long period. Residues indicating the utilization of wax, pitch or resin for sealing Neolithic clay pots have not been found yet, unless terebinth was used as a sealing agent. It would, of course, have been possible to ferment fruit must in those early jars. However, as fast as must changes to alcoholic mush, the mush becomes an oxidized and later on vinegar-like liquid if exposed to oxygen and bacteria. Today’s traditionally produced amphora-wine does keep a little longer than conventionally produced wine, when exposed to air (two to three weeks, sometimes longer), but then it definitely begins to turn bad. Even McGovern mentions in one of his publications that in early Neolithic times there were no jars to keep wine over a longer period (22). Wine definitely did not fit the subsistence economy of the Neolithic, but grape syrup certainly went well with the needs and potentials of the Neolithic community. Towards the end of the Neolithic Age, crop- and livestock-farming in the Near East was developing to such an extent that basic nutritional needs had been covered and first signs of surplus production were noticeable. Before, arable land had merely been worked to acquire essential foodstuffs. I assume it was the first time that cultivation areas were also utilized for further, non-vital produce. A simple peasant would not have done this job willingly, though, unless he was somehow rewarded for his work. During the first half of the Chalcolithic Age, hierarchically structured settlements formed for the first time, trading centers came into being and script developed. Looking back on early history we realize that any pictorial and written documentation about wine points to the fact that at first it had been consumed by an elite only, i.e. priestesses and priests, kings, queens, or their highest representatives. The relevant period is the second half of the 4th century till about 1000 BC. From then on more high officials, high-ranking visitors and –officers were also allowed to enjoy wine at banquets and ritual activities. So, in the early phase of wine consumption, the beverage was obviously drunk as a cult drink. An elite and corresponding social structure were essential preconditions for the production and use of wine as well as for the development of a culture of wine. Neither of the two existed in the Neolithic. According to Margareta Tengberg who has taken part in different excavations in the Near East, the first fruit trees, i.e. olives, figs, dates and also grapes, were not domesticated any earlier than in the late Chalcolithic (from about 4500 BC onwards). At that time, all necessary conditions for successful wine production had been met. Although M.Tengberg does not rule out the possibility that grapes had already been cultivated before, it remains an open question whether the end-product was wine. What is it if it is not Wine? 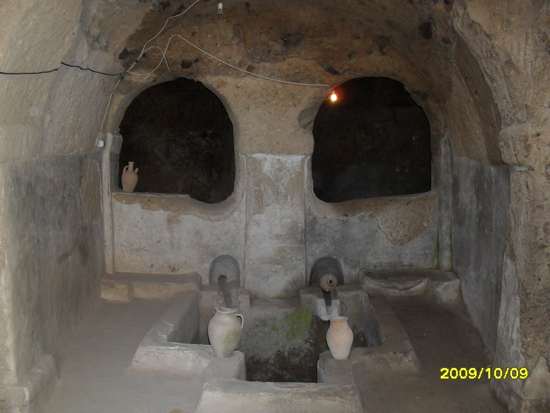 Raisins, vinegar and syrup (pekmez in Turkish, bakmasi in Georgian) are products that comply much better with the conditions of the Neolithic period than wine. People were already widely experienced in drying fruits. Dried fruit could easily be kept, later soaked in water and mixed with other foodstuffs whenever wanted. Vinegar, just like wine, would not keep for longer in those rough Neolithic clay jars. In stone pots, however, vinegar would keep much longer and was therefore well suited for pickling and preserving fruits and vegetables. Moreover, diluted vinegar seems to have been a popular thirst quencher. At least, we learn from early history that whole armies of soldiers used to drink spiced diluted vinegar. At that time, however, there existed good quality jars for keeping runny liquids over a longer period of time. Pekmez is a long-lasting fruit juice concentrate or syrup. It was a particularly nourishing food item for the people of the early Stone Age. In the Near- and Middle East it is produced and consumed on a large scale even today. 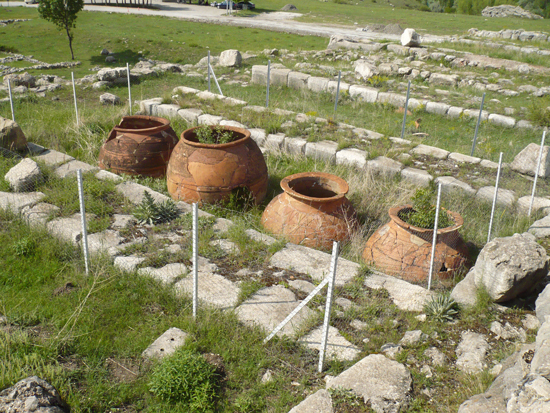 N.Miller argues that residues of tartaric acid in Neolithic jars might be from vinegar, raisins, pekmez and other tartar producing plants, but she adds that for making pekmez large amounts of firewood would be needed in order to thicken the juice, whereas grape juice ferments on its own account. She concludes that at such an early period of time the much simpler processing method must have been applied, which would have been the production of wine (24). Her argument, however, is not consistent with the location of the Neolithic open fireplace in the Near East: The open-hearth is mostly about one square meter large and laid out with round river stones. A big pan placed above the center of the fire can quickly be heated up to high temperatures, while several smaller and bigger pots are resting around the fireplace and are thus being kept warm and also heated up with less energy than the pan in the center. When grape juice is heated in pots this way, the necessary temperature to kill off yeast bacteria and make the juice long-lasting is reached in no time. The longer the juice is resting at the place where it is heated up the thicker it becomes. No extra firewood is needed during the process. Nowadays the juice is usually thickened to one fourth of its original quantity, which is not necessary. Concentrated grape juice is also long-lasting as thin syrup. Another advantage of grape syrup is the fact that a jar of pekmez does not have to be sealed but only covered. My own experience is that the syrup must not be too thin, though, because a Neolithic jar will still leak. On the other hand, when the syrup is sufficiently thick it seals the porous clay of the Neolithic pot fast and effectively. Pekmez is particularly nutricious and sweet, on its own, mixed with flour or the pulp of pulses, prepared and dried together with nuts and other food items. 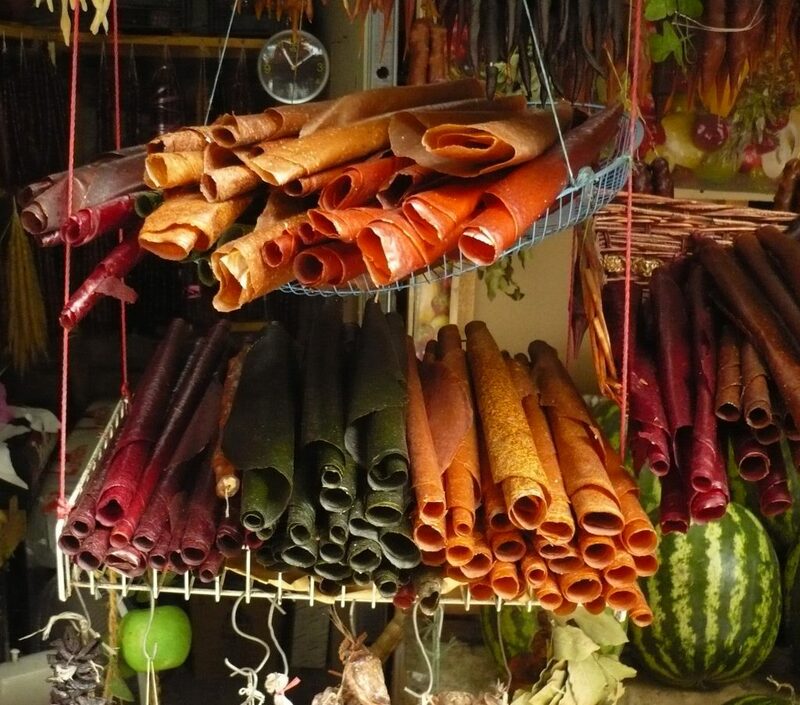 Pekmez and köftür (Turkish), bakmazi or badagi and Tchurchela (Georgian) are just a few delicacies made from fruit syrup. Raisins and other dried fruit had certainly been known before the Neolithic Age. As concerns pekmez I consider the cultivation of bigger and sweeter grapes for more and better pekmez to have been more likely than the cultivation of grapes for wine-making. In my view, the cultivation of better quality grapes would have resulted in more and better quality syrup and therefore securing and improving the high-quality food, pekmez, would have been a basic aim. Hence the early cultivation of grapes does not necessarily prove any wine production. By thickening the juice even of the rather sour wild grapes it was possible to obtain some quite sweet syrup. A drink made from wild grapes, however, tastes rather bitter during as well as after fermentation. Once it has fermented, the beverage normally oxidizes and can only be drunk diluted or mixed with other “tasty” ingredients. Pekmez production in Güzelyurt/ Cappadocia. 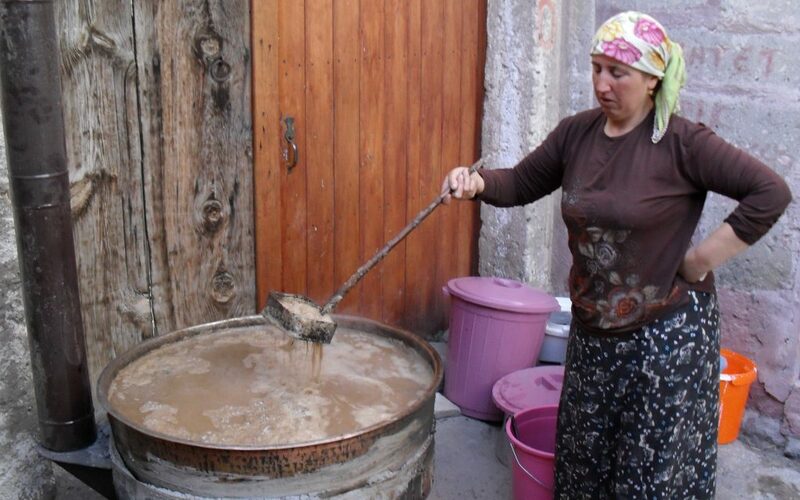 In nearly all houses large quantities of pekmez are made in autumn. 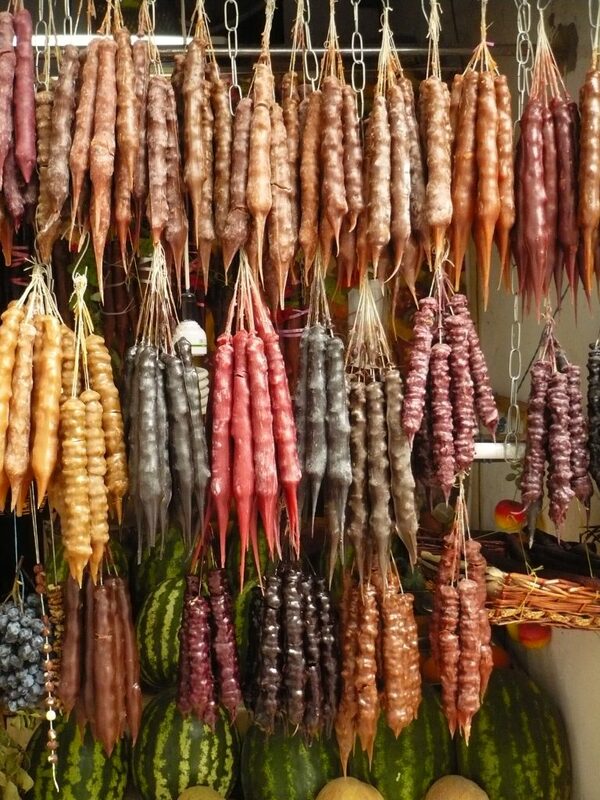 Nuts are strung on threads, then dipped in pekmez that has been thickened with flour and finally dried in the sun. Insofar it is again more probable that the Neolithic people started cultivating bigger and sweeter grapes to secure and improve the high-quality food pekmez, but not because they intended to make wine. In Neolithic times pekmez was apparently one of the major food items besides cereals and pulses. The great significance of pekmez even nowadays is evident when we consider how much grape syrup is currently consumed. Wherever grapevines are grown in Turkey, nearly every family make their own pekmez and food items based on pekmez. Two to three millimeter thin layers of pekmez with bits of fruit are dried in the sun. This type is called tklapi in Georgia and kurutma in Turkey. Pekmez mixed with walnuts and flour in the shape of a sausage is cevisli socuk, i.e. walnut-sausage in Turkish. Different fruits and nuts incorporated in pekmez fruit-sausages are bandirma. Other mixtures of pekmez with flour and nuts are generally referred to as lokum in Turkey. Two centimeter thick layers of pekmez are blended with fruit pulp and flour, sun-dried and then cut into cubes. They are köftür. Pekmez with bits of fruit or nuts has become world-famous under the name of “Turkish Delight”. Hajji Firuz in Iran, Areni in Armenia and Dilli Tash in Greece are repeatedly referred to as the earliest settlements to produce wine. At Hajji Firuz, a Neolithic settlement (5400-5000 BC), six clay pots with a capacity of ca. 9 liters each were found in a kitchen. In one of these pots indications of beer were made out. Another jar showed traces of tartar, which McGovern considered as an indication of wine (26). The other pots did not provide any signs of their prior use. Since tartar does not represent any proof of wine, it is only logical to assume that the substance prepared in the kitchen of the late-Neolithic house was pekmez rather than wine. Moreover, as the only residue was tartar, it can be assumed that just the juice of the grapes without skins was kept in its thicker syrupy consistency. The questions arise whether those grapes were still wild or already cultivated and if they pressed so that only the juice was made into pekmez while the remaining parts were used to make other fruit products. At Areni, Armenia (4200 BC) grape juice, maybe the fruit as well, was processed after the grapes had been trodden in a wine press, but no grape skins were found (27). 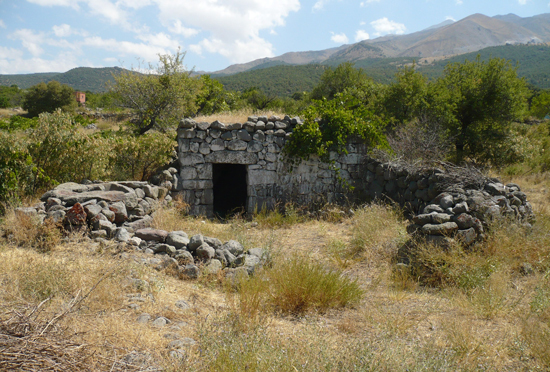 It is not certain that wine was made at Areni, therefore it may as well have been a production site for pekmez. The earliest find of pressed cultivated grapes (vitis vinifera) is known from Dikli Tash in Greece. 2460 grape seeds and about 300 grape skins were found, dating back to 4200 BC. In addition to the Dikli Tash findings, remains of grape skins stuck to seeds were found in many places, which must be taken as another indication that grapes were pressed to get the juice but skins and seeds were left unused (28). About 3000 years before Dikli Tash, between 9000 and 7000 BC, numerous remains of hackberry fruit (celtis) in a clay tub at Catal Hüyük (29) and the large number of about 17,000 celtis seeds from Asikli Höyük indicate the use of the fruit or rather the fruit juice. (pers.com Prof. Miriban Özbaşaran, head of Asikli Höyük excavation). In East Georgia, the traditional Georgian kvevri wine (kvevri = clay jar) is generally fermented together with all the skins and seeds whereas in West Georgia only a certain amount of skins and seeds is used. The fermented wine stays in a clay jar for eight months before it is separated from grape skins, seeds and stems. Red and white wine are treated in the same way. We do not know for sure whether grape juice was already fermented together with skins, seeds and stems from the beginning of wine production or only later. In the Neolithic Age, grapes were at first probably cultivated with the aim to have bigger and sweeter fruit for making the food product pekmez. Wine-making in culturally relevant quantities began much later when grapes were sweet and the following three preconditions were given: 1) suitable pottery for fermentation and storing, 2) secure food supply, 3) adequate demand. Thus it is understandable why there were no specific indications of wine-making before the second half of the Chalcolithic Age. From then on, however, evidence was increasing fast. Since cultivated grapes and their juice for pekmez already existed and satisfactory experience with the changeability of fruit juice had been made, wine-making could begin as soon as there was demand for wine. Margareta Tengberg’s conclusion is similar, even though her argument is based on a different observation: First signs of the cultivation of nutritious fruit trees only appeared several thousand years after the Neolithic Revolution. Then wine and olive oil were soon becoming very important, not so much because they were additional foodstuffs but rather as precious trading goods that could be exchanged for different products of the already more developed Chalcolithic period. The nutritious foodstuffs disseminated fast on the trading routes of the late Chalcolithic and early Bronze Age, as did the vessels and tools for their production (30). Producers as well as consumers were essential for the development of a proper culture of wine. In excavations, villages and farmhouses were searched in vain for any tools or equipment giving proof that wine was produced and consumed during the Neolithic and early Chalcolithic Age. During the second half of the Chalcolithic, however, the first centers formed and later on became small cities with hierarchical social structures. Those places offered the necessary preconditions for the development of a wine culture. Grapes had already been cultivated and the quality of clay jars was good enough for keeping perishable liquids over a longer period of time. 14. Barnard,H.,et al. (2010) Chemical evidence for wine production around 4000 BCE in the Late Chalcolithic Near Eastern Highlands. Journal of Archaeological Science. 17. Zohary, D. (1996) The Domestication of the Grapevine Vitis Vinifera L. in the Near East, in: The Origins and Ancient History of Wine, eds. P.E. McGovern, S.J. Fleming, S.H. Katz. The University of Pennsylvania, Museum of Archaelogy and Anthropology. Philadelphia.